“It may be nonsense” says famous founder of Dadaism, Tristan Tzara, and for the most part, it could be. But there's something undeniably clever about Tom Stoppard's 1974 play, written in the very early stages of his career. 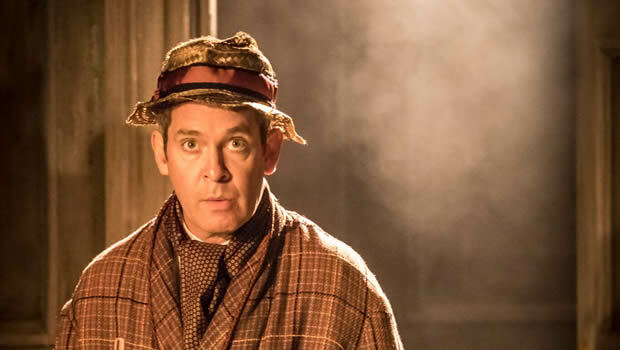 Imaginatively revived by director Patrick Marber, Travesties is the manic, mind-boggling saga about socialism, capitalism, Leninism, Dadaism and... trousers. Tom Hollander is Henry Carr, the wide-eyed narrator who swears blind that he was in the British consulate. He switches effortlessly between the doddering dressing gown-wearing fool to his sharp-witted, opinionated younger self. There's a crispness to his voice that is utterly recognisable; a comic timing that has you guffawing at the simplest of lines. Typically, Stoppard's play is a puzzling affair, requiring the utmost concentration from even those most switched-on theatregoer. It's difficult to decipher what's real and what’s not, as characters from his star-turn in Zurich's An Importance of Being Earnest arrive. You are left to add up the pieces, formulate the situation, as scenes are played over and over with the only the dinging of a bell breaking up the action. There's a lot of discussion about the importance and relevance of art and the bourgeoisie, and Henry becomes increasingly wound up about his butler, Bennett. It seems dreadfully relevant, even now, when art continues to be precariously side-lined in favour of wider politics (can the two go hand in hand, the playwright suggests). Freddie Fox is brilliant as the sharp, flamboyant Tristan Tzara, leaping about the stage with declarations and defamations. But Henry is a man shell-shocked by the trenches, and is also the most unreliable witness to tell his own story. Tim Hatley's stunning set winds back into the stage; a trench-like formation of doors and panels, suggesting a maze of winding corridors that’s all very similar to Henry’s muddled mind. Neil Austin's lighting design hits the stage beautifully. It's a baffling, amusing and brilliant play, but you can't help but notice that a slight element of pretension creeps in round the edges. As I sat in the audience, I couldn't help noticing a lack of diversity. But it’s a brilliant revival of the play, one that will be remembered for a while – even if not by Henry himself.